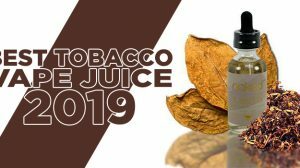 On August 8th, the modified risk claims of electronic cigarettes and vaping will essentially become illegal in the United States as the FDA has falsely deemed that these products are no different than smoking cigarettes. 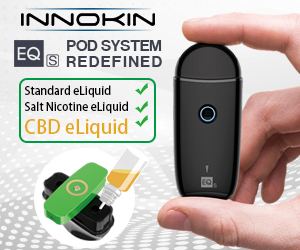 No company can make the claim that vaping is healthier, or less harmful than combustible Tobacco and vape shops can no longer advise smokers that this technology has the potential to save their lives for fear of repercussions from the Government. If you want to make a modified risk claim on your products, you better be prepared to shell out for research studies that are designed from the start to be unattainable, as the FDA requires research showing how each individual product you make is helpful to the population as a whole. They don’t care about research from oversea’s and ex-smokers turned vapers in America don’t exist according to the man in charge of over site, Mitch Zeller, the millions of us walking around are in denial because we are all still smokers. Mr. Zeller et al seem to believe that by gagging the industry the phenomenon known as vaping will disappear, future quitters will go back to the carnival ride that is Pharmaceutical Alley as they attempt in vain to break free of the money-making machine. 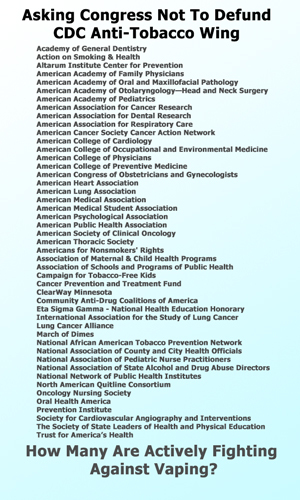 They believe that by effectively banning technology that has been proven to be less harmful than smoking and is being promoted by one of the worlds leading bodies of Physicians as a way to help people say goodbye to their tobacco addiction, the status quo that they rely on for funding will return — when the very people fighting against vaping are the same groups begging congress not defund their campaign for a smoke-free world, its very telling. 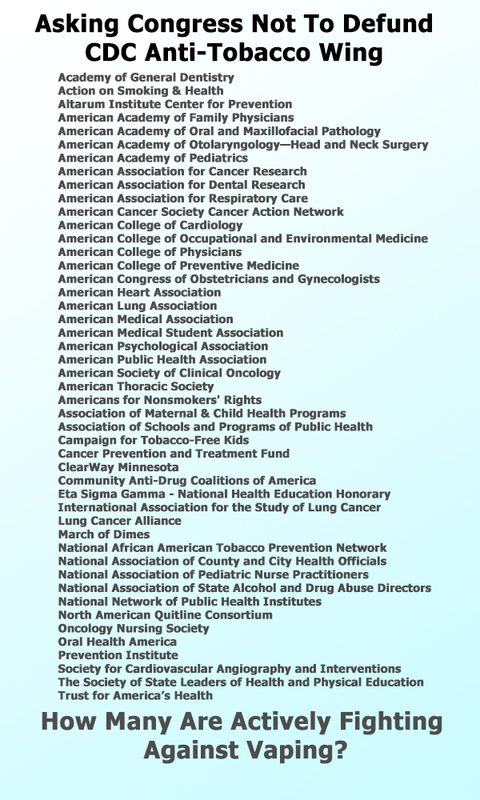 While this illustrious group of health care professionals are doing everything in their collective power to bring smokers back out of vape shops and into the doctors offices, they are failing to address the huge elephant in the room. If vaping was just an industry they may stand a chance of making it go away, they can close the doors of businesses but they have a much bigger problem to worry about. They aren’t fighting against an industry that can be bullied into submission, they are fighting against an organised, educated and highly motivated community of people who came together because they bought into the idea that they needed to stop smoking and the methods being peddled by the Public Health industry — those guys in the box and a whole lot more — didn’t work when vaping did. The FDA can attempt to gag the industry but it isn’t able to close the mouths of the community. They can threaten store owners with what ever they want, it won’t stop individuals telling the truth. The Federal Agency can try to force the industry to lie to the people, but the people already have millions in their midst who know the truth about vaping and will continue to spread it for as long as they have the breath to do so. You try to take away people’s choices, especially when they whole heartedly believe that they are in the right, you will always end up with a fight on your hands. The gag order won’t work because there are already too many people who know and understand the truth, apparently better than the federal government, and until the FDA has the power to bring down its wrath on each citizen, the truth will prevail. Pandora’s box has been opened and no matter what they try it’s never going to close again. And I am one of those citizens!!! As am I. We vapers do have power, even if it is only by disrupting their web sites with truthful information about vaping, sending comments to the press and media, barraging our elected representatives with letters and emails. I count every “tobacco control” website that deletes my messages and bars me from further comments as a victory! Even if those in the industry cannot make health claims, vapers can and should. I have been vaping for 4 years and my lungs are in better shape now. Than they have been in the last 25 years. Because I don’t smoke cigarettes any more. My lung doctor was amazed that I have more air movement in my lungs. I also have COPD which is under control now because I vape.I’m not going to stop vaping. And I will not start smokeing cigarettes again. I’m with you Latrice I was also diagnosed with COPD and because of vaping I no longer have an issue with my breathing. 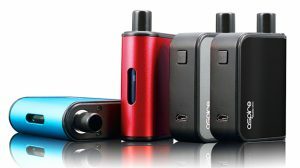 As a vape shop owner, they CAN NOT tell me that I can’t relay my personal story about quitting. They CAN NOT restrict me from making factual statements such as “The Royal College of Physicians conducted extensive research and concluded that vaping is 95% safer then smoking”. I seriously hope store owners and employess understand this,.. You CAN give your personal story, and you CAN state FACTS! I am in total agreement with you Brett. I manage a shop in Tennessee and have been very vocal about my personal experience as well as the Royals findings. I also state that as adults we are free to do as we choose when it comes to our hobbies and our personal health decisions. Within a week I was back to 40 a day, soon enough I was smoking 50 a day again, I gave everything a real try over and over and over, finally I gave up on quitting and accepted the fact that smoking was probably going to kill me in my mid 40’s maybe early 50’s. It really bummed me out, I became depressed for a long time and felt like I was leading a mostly meaningless life I started drinking a bit more around this time and any smoker knows that smoking and drinking goes together hand in hand, I was smoking 60+ smokes every time I was drinking..
One day me and a friend well an inlaw my drinking buddy went to the store to get smokes and on the counter was a display with CE4 Blister Packs and different flavors of juice, I wasn’t interested I had tried vaping before, a cigalike (zero nicotine) which I shot out because it failed miserably like everything else, however my buddy was thinking about quitting smoking and decided to buy 2 one for him one for me so he would have someone to quit with, despite my reservations about it, we filled them with juice, he had a cherry flavor, I had a spearmint flavor(my favorite gum)and started vaping away, it sort of worked over the next 2 weeks I cut my smoking in half but then my device broke at the same time some study was released saying they were worse than smoking, we decided to give up on vaping..
A few months passed and a couple more quit tries, one night we had a party, I ended staying up till like 6 in the morning, I smoked about 80 or more cigarettes that night, I finally got to sleep I woke up about noon coughing really bad after it subsided a bit I tried to take a few breaths and nothing, I was breathing in and it just wasn’t working, my life was basically flashing before my eyes all of a sudden I puked and coughed up so much phlegm, tar and some blood it was absolutely disgusting, probably 30-40ml of it and started breathing again at a very minimal capacity but enough to keep me alive, at this point I was so exhausted I went back to sleep, I woke up a few hours later looked at the puddle of goo on the floor and thought to myself that my estimate of living to my mid 40’s maybe 50 was off, I knew if I continued down the same path I’d be dead by 40…. 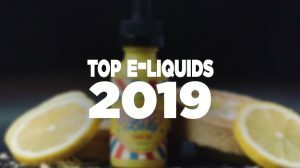 I looked back at all my quit attempts and the only one that came even close to working was that cheap CE4, I decided to do a little digging into the study that scared me away from vaping and as it turns out the media lied to us, the results actually showed that in normal conditions vaping was far less harmful than smoking, even the scientists that performed the study commented on it saying so. Help others by helping yourself! Thanks for sharing your story… keep at it … we have a right to be smoke free. I’m a 2 yr smoke-free vaper, and I also have a website… and they will NOT make me stop telling the truth: vaping WORKS, and the FDA IS CORRUPT, and LYING. I have been vaping since March 2013. It literally saved my life. In January 2013 I had pneumonia with a collapsed right lung. A bronchoscopy was done and I was told if I smoked again I would die. I was using oxygen 24/7. At that time I was put on the nicotine patch which made me sick to my stomach and dizzy. One of my friends had an e cigarette which she let me try. The next day I went to the local vape shop and bought my own, along with 2 bottles of juice. Haven’t smoked a real cigarette since nor have I had to use oxygen anymore. I finally got my husband to quit and use the e cig the following year. Our home is Smoke Free! 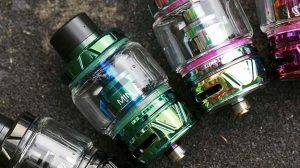 I am probably one of the people using vape for the longest time. I started seven plus years ago after smoking for years. My lungs and heart were checked out two years ago and they said everything was amazing and the doctors were so impressed from my improvements after smoking for years. I haven’t quit vape or nicotine but I’m rid of all of those toxic substances in cigarettes and tobacco. I feel healthier for it and smell better. I vape using 808D’s, not the big bong ones and it does me just fine and I don’t put out all of that crazy vape fog. I also am one of those citizens .its about time big pharma and the fda start doing what’s right for the people and not their pockets. After 20 years of smoking cigarettes, almost 2 packs a day I had a mri done that showed a patch of emphysema and tar lined lungs. Now after 8 years of using an ecig according to my Dr my lung functions have improved and according to a recent MRI my lungs are almost clear. The FDA really need to be better informed because the ecig is improving many lives after cigarettes. Maybe we should just sue them for not stepping up and banning cigarettes before we all became addicted to the nicotine and ruining or lungs to begin with? How Can You Be Nicotine Free But Still Labeled A Smoker?